for professionals in Competitive Intelligence and Strategic Planning. The second edition of this award-winning "gold standard" on personal information can now be ordered! In this fully revised and updated second edition of her bestselling guide, author Carole A. Lane surveys the types of personal records that are available on the Internet and online services. Lane explains how researchers find and use personal data, identifies the most useful sources of information about people, and offers advice for readers with privacy concerns. You’ll learn how to use online tools and databases to gain competitive intelligence, locate and investigate people, access public records, identify experts, find new customers, recruit employees, search for assets, uncover criminal records, conduct genealogical research, and much more. 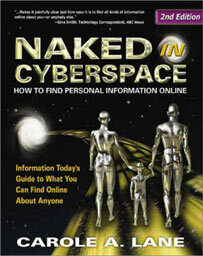 Naked in Cyberspace is the ultimate handbook for anyone who needs information about people. A companion Web directory provides links to more than 1,000 important reader resources. The ultimate how-to guide for anyone who wants to use commercial and professional online services and the Internet, to locate personal information. A must-have for employers, marketers, lenders, journalists, biographers, private investigators, genealogists--anybody doing personal research today. The first and only comprehensive guide of its kind, this book takes a practical approach to an important and controversial Information Age topic. Written by Carole A. Lane --one of the world's leading experts on personal records research. Now that most personal records are searchable online, the bureaucratic red tape that used to protect our secrets from prying eyes has been stripped away. . .and we're all naked in cyberspace. Without taking sides on the right or wrong of using online ingredients to compile a detailed dossier on anybody, this book is a veritable cookbook for electronic researchers. Screen potential suitors, partners, tenants, etc. Author Carole A. Lane is one of the most savvy and respected online researchers in the world. Lane, former senior systems analyst with TRW Information Systems (Consumer Credit Systems), is president of TechnoSearch, Inc.--an independent research firm specializing in competitive intelligence, market research, and personal records research. She lives in Vista, California. Without taking sides on the right or wrong of using online ingredients to compile a detailed dossier on anybody, this book is a veritable cookbook for electronic researchers. What Type of Research Interests You? on the Internet and Commercial Bulletin Board Systems? What Do You Know About the Person? How Long Has It Been Since You Knew Where This Person Was? Is the Person Famous? An Expert? What Is Your Relationship to the Person? Why Are You Looking for Him? Where Have They Been? What Have They Done? How Can You Identify an Expert?